The Economist.com data migration to Drupal – All Markup News. Home » Drupal News » The Economist.com data migration to Drupal – All Markup News. The Economist is now using Drupal 6 to serve the vast majority of content pages to its flagship web site, economist.com. The homepage is Drupal powered, along with all articles, channels, comments, and more. The Economist evaluated several open source CMS and proprietary solutions aimed at media publishers. In the end, The Economist chose Drupal for its vibrant community, and the ecosystem of modules that it produces. The Economist will be adding lots of social tools to its site over time, and doing so on its existing platform was too slow/inefficient. The Economist hired Cyrve to migrate its large and volatile dataset to Drupal. With the sponsorship and encouragement of The Economist, Cyrve open sourced its migrate module which is the heart of its migration methodology. The Economist and Cyrve hope this article helps more sites migrate to Drupal. Posting rate exceeds a comment per minute. Powered by a custom Cold Fusion application and an Oracle database. The legacy schema attempted to impose an object-oriented design on a relational database. There was a central cms_object table, holding all kinds of content, with content-specific data two degrees of separation away (with a cms_relations table in the middle). This meant that joins were quite complex, even for conceptually simple cases. The text content itself was embedded in an NITF object stored in the database, requiring run-time XML parsing to explode it out into Drupal fields. Character sets were a challenge. Inevitably, source data that’s supposed to be in UTF-8 (or other) isn’t consistently so, and it took a great deal of trial-and-error with encoding functions like iconv() to get it right. This is a recurring issue in data migrations. www.economist.com Drupal site makes heavy use of node reference fields. During migrations, you need to relate an article to something that does not exist yet in the database (e.g. an article can have several related articles). Migrate module has built-in support for this. It creates a stub node when the reference does not yet exist. The stub node will get filled in properly later when its information is available. * will feed data to the migration. * by the Migration class, and create Drupal objects. * associated with the mappings. // and their resulting Drupal objects. // This sort assures that parents are saved before children. // Create a MigrateSource object, which manages retrieving the input data. // Assign mappings TO destination fields FROM source fields. // exactly what the status is when developing a migration process. // mapping and migrate_ui will link directory to it. The Economist used Migrate 1 for this project but we’ve updated all examples and dicussion in this post for Migrate 2. // Source dates are in ISO format. The end goal here is that you wind up with a completely native Drupal site, as if you had launched on Drupal from the very beginning. An explicit hook for this massage the data encourages that outcome. In order to perfect your mappings and transformations, you have to run the migration over and over again. A key benefit of migrate module is that it makes this process fast and effortless. Here is a typical sequence of drush commands where we import and rollback a few times. The rollback commands work so effortlessly because migrate keeps a map between legacy ID and Drupal ID as it imports. With this map, we can delete just the right nodes/users/terms etc. for this migration and no more. Also note that we can cleanly limit the migration to 10 items in this case. This is quite a bit faster than running all 3 million or having to manually cleanup after an aborted migration. An alternative to rolling back and importing is updating in place: drush migrate-import articles --update. We used this when rolling back would have deleted important data (e.g. rolling back a node would have deleted its comments). Also very useful in migrate module are its admin web pages which inform clients and developers about what’s mapped and what is not. Further, open issues about any column/field can be assigned to the client or to the migration engineer. These issues can be linked to client’s issue tracking system as well (see graphic). These web pages ease client anxiety during the days before going live with Drupal. Migrating a live site like economist.com to a new platform is like open heart surgery on your business. Cyrve and the migrate module work hard to make this a routine, reliable and repeatable process. The map tables that enable us to rollback effectively also are a key to auditing the data. Audit processes can be implemented to make automatic comparisons between raw source data and the resulting Drupal objects, because we know precisely which Drupal object resulted from a given source content item. Migrating a metric ton of data like www.economist.com, begs for optimization of insertion rate. The best tool for finding slowness is xhprof. Devel and drush and xhprof work great together now, as drush reports the URL of your profiling report at the end of each run. Use that report to identify slow code and remove/refactor it. We had to disable token module in order to achieve excellent performance. A large business like The Economist proceeds cautiously with a platform change. In order to mitigate risk for client and for migration engineers, the migrate module supports incremental migrations in addition to “all at once” migrations. An incremental migration imports only the items which have been added or edited since the last time this migration ran. These items are identified by maintaining a “high-water mark” for each migration that comes from a primary key or datetime column on the source data. Migrate module automatically moves this high-water mark as content gets imported. The Economist has made heavy use of this feature. Once incremental migrations are working nicely, The Economist was able to watch her “staging” Drupal site as it keeps up with new content/users etc. 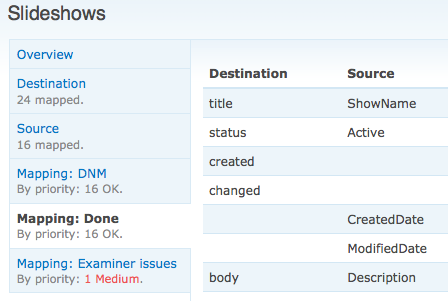 Drupal stays in sync, just a five minutes behind the live site. This staging site is a great place for identifying bugs with the site in addition to bugs in the migrated data. The true beauty of this approach comes when we go live with Drupal. All that’s required is to move DNS records to point to the Drupal servers instead of Cold Fusion. There is no big bang migration where everyone holds their breath. The Economist has already come to know and love its upcoming Drupal site and making it live was all party time :). The Economist presented at Drupalcon about our our Drupal build and also about our Scrum project management strategy. Folks interested in media publishing with Drupal should join the Newspapers on Journal group.